“This is the message we have heard from him and proclaim to you, that God is light, and in him is no darkness at all” (1 John 1:5). Last Friday we spent most of our time considering the author of 1 John, defending the traditional position that the author was John, the beloved disciple. Before we look at today’s verse, let us consider 1:1–4 and examine the theological content given to us in these verses. We have noted that John wrote his epistle in order to provide assurance for his original audience, explaining that they in fact were true Christians. The false teachers who had gone out from them left this audience with some doubts. Thus John wrote to help assure them of their salvation. In his first four verses, John provides us with several themes to which he will return again and again — teachings that refute the claims of false teachers and give assurance to believers. The first theme is incarnation. The message proclaimed in this letter was not only heard, it was also seen and touched in the person of Jesus Christ (vv. 1–3). The false teachers denied the incarnation of the Son of God based on a “higher” revelation given to them. 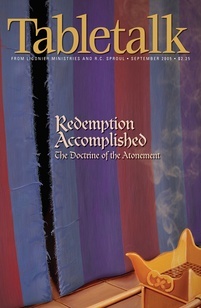 In doing so they denied that God’s revelation is available to all people who are willing to receive it. By taking on a human nature, God gives further affirmation that His message of salvation is for all people no matter their background or education and is not solely for an elite few. The incarnation reminds us that any person can know God truly though never fully. The second theme is love. In verse 3, John says that he writes so that his audience might have fellowship with him and other Christians. We will see that love of God and love of others is emphasized as a fundamental mark of Christian discipleship in this letter, especially since the false teachers did not truly love the brethren. Finally, verse 5 today gives us the final theme that refutes false teaching and provides assurance — personal righteousness. We read, “God is light, and in him is no darkness at all.” As we will see over the next few months, personal holiness assures us that we belong to God because all of those who claim to be of God must reflect, however imperfectly, the holy character alluded to in today’s verse. Many non-Christian scholars of religion stress the difference between man and God to such a degree that they end up saying we cannot truly know anything about Him at all. The incarnation affirms that despite the Creator’s transcendence, God has communicated with man. If you are tempted to think we really cannot know God or absolute truth, remember that His incarnation in Christ Jesus shows us we can know Him. Thank Him for speaking on our level.